When someone moves into a nursing home, their lifestyle changes. They no longer have as much space as they used to. This changes what you can and can’t buy for them. 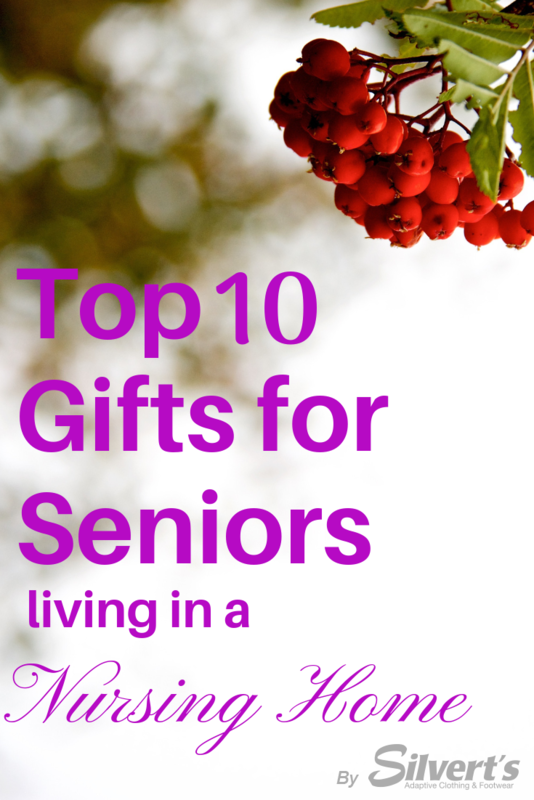 We have put together a list of top ten gift ideas for someone who is living in a nursing home. Give them something to make their home smell like home. Nursing homes tend to have a certain smell. Getting an essential oil diffuser can let them make their room a bit more like their own. Many oil diffusers can come with calming essential oils, giving them one of those smells can alleviate any stress they might have. This can be a lovely memory for them as well as a topic of conversation with all of their friends at their long term care facility. There is a lot of downsizing involved in moving into long term care. A whole house now needs to fit into a room. This can include no more space for all of their photo albums. Ask to borrow those photo albums and scan them all on to a drive and move it on to a digital photo album. This also helps them with dexterity problems. Old fingers tend to get arthritis, so turning pages in an album might be a difficult task. A digital photo album allows them to look at the photos without having to turn the pages. No, we are not talking about a gift for your university child. A mini fridge can be very helpful for a loved one in a nursing home as well. If they ever go out for a lunch with family, they can bring leftovers back and eat them later. Stock the mini fridge with nice little snacks that they can have when they don’t feel like making the trip to the lunchroom, they have something small to snack on. Giving them cosmetics or toiletries can give them things that they can’t necessarily go out and get themselves anymore. For men, go grab an extra razor for them, or some shaving cream. For women, make a small basket of mascara and eye shadows. If they don’t wear a lot of make-up, or don’t need those types of cosmetics you can get them more of a practical kit. Put some toothpaste and lotion together; maybe add that with a new toothbrush or denture cleaner. Give them a reason to connect with other or have something to do when you go to visit. Having a two person game like chess will give them something to do with other residents in the nursing as well as something to do to keep their brain sharp. Puzzles are great as a calming exercise, lightly working the brain. If you are buying for a parent and have kids, get a game that you know your kids love playing so they can play it with them when they visit. In long term care and retirement residences, slip resistant footwear must be worn at all times. This is for slip and fall prevention and the safety of the residents. So getting your loved one a new pair of slip resistant slippers will not only be a nice gift but something very useful for them and that they in fact need. Having a comfortable slipper is perfect for indoors, with extra cushioning so they don’t have to feel like they are wearing stiff footwear indoors. Look at what shoes they have on currently; if they have any holes in certain places they might need a wider slipper. This is also a good way to pick out the right size. During the nightly trip to the washroom, it can be a hassle to have to put slippers on. But to remain safe it is important to still have slip resistant footwear. Slip resistant socks are the perfect solution. Gripper socks can be worn to bed, and that way you don’t have to worry about putting anything on while taking your trip to the washroom. This gives them something where they can put all the knick knacks they have lying around. Whether it be tv remotes, and extra pair of glasses or their Kleenex, it can be a nice place for storage items that are used often. Make it even easier for them by giving it wheels. This allows them to move it from their reading chair to the bed depending on what they are doing. Do they have a walker or a wheelchair? If they have their own, sometimes it can get lost amongst the other walkers in the facility. Get them things in which they can jazz up their own walkers or wheelchairs. This could be gems to put on it, or a fun creative way to make a name tag. If you are looking for a gift for a grandparent, this could be a fun craft to do with them. A wheelchair pouch is a nice addition to their walker or wheelchair. This way they have a place to keep their valuables, so they don’t have to leave them around anywhere. This is also nice if they are living in a shared space, if they have a roommate or doors that don’t lock, they might want a bag in which they can take around valuables. This blanket can be a nice cozy decoration to their room. It’s a great way to personalize their room. Get them a nice fuzzy blanket that’s their favourite colour or that has a favourite animal on it. This is a great way to make them feel more at home while keeping them warm during the winter season. If they are wheelchair bound, this could be a wheelchair friendly blanket. These blankets have snaps where you can attach the blanket to the arms of the wheelchair. If they want a bit more than that, a wheelchair cape can be what they are looking for. This is a jacket with one wide opening at the top that you can put over your head instead of having to wrap it around and do up. This cape is designed to avoid getting caught in a wheelchair, so it is higher at the back so you can sit comfortably in a wheelchair with your jacket. Last but certainly not least, a new addition to their closet can brighten up their wardrobe. A new shirt or a nice pair of gabardine pants for church or other outings. A pair of elastic waist pants or even open side easy touch pants is helpful for elderly. If they are having problems with dexterity or arthritis in their hand, doing up buttons can be hard for them. These pants will let them dress individually with ease. Do they have any mobility problems? If you nothing they are more stiff than they used to be, or are having joint pain in their shoulders, open-back tops can be just what they need. An open-back top eliminates having to reach to put anything over their head. Is your loved one wheelchair bound? Adaptive clothing can help the daily struggle of getting dressed. If they have help getting dressed in the morning, it will make daily stressing go more smoothly. Wheelchair pants are open-back pants, this design is so that one can stay in a seated or lying down position while being dressed. If your mom or loved one wore dresses all their lives, open-back dresses are the perfect transition item. This open-back design allows them to stay in a seated or lying down position, but they can still wear dresses. When people move to wheelchair mobility, it restricts them from doing many things. Give them clothing that they can still wear with ease, for many it will make them feel more comfortable mentally. Each of these gifts can be personalized through colour and design. Remember to keep the receiver in mind when buying the gift. You can always mix and match gift ideas, putting a nice top with some comfy slippers can be a way to give them comfort and style. Giving them a mini fridge and some goodies to put in it can also be a nice touch! The sky is the limit on gifts, we hope that with the help of this nifty list, you will be able to find the perfect gift.